Following on from the surface mount reflow oven I built, I thought I would report on its performance and my experiences with surface mount devices. 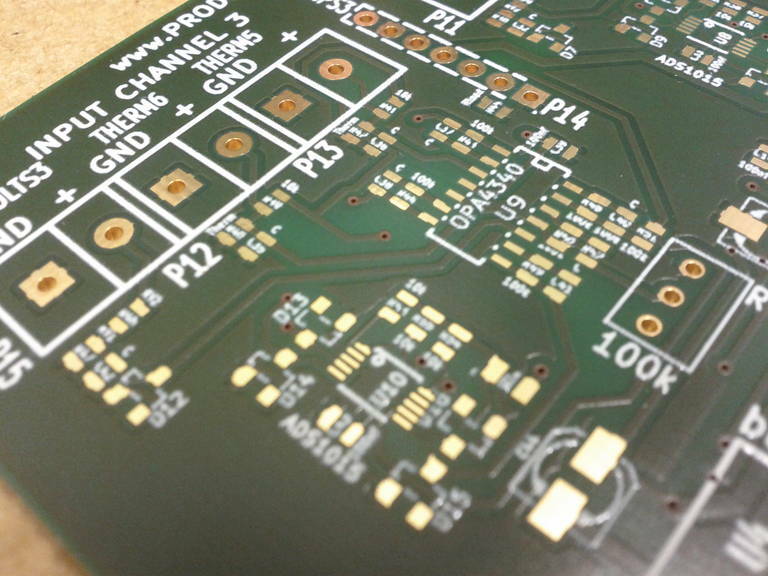 I had designed a relatively complex board which had a number of devices which were only available in a surface mount package. So I decided to produce this board with a majority of surface mount components. I’ve got to admit I’m very impressed with the results – in terms of speed and ease of construction, final quality or junctions, size of board and cost of components. 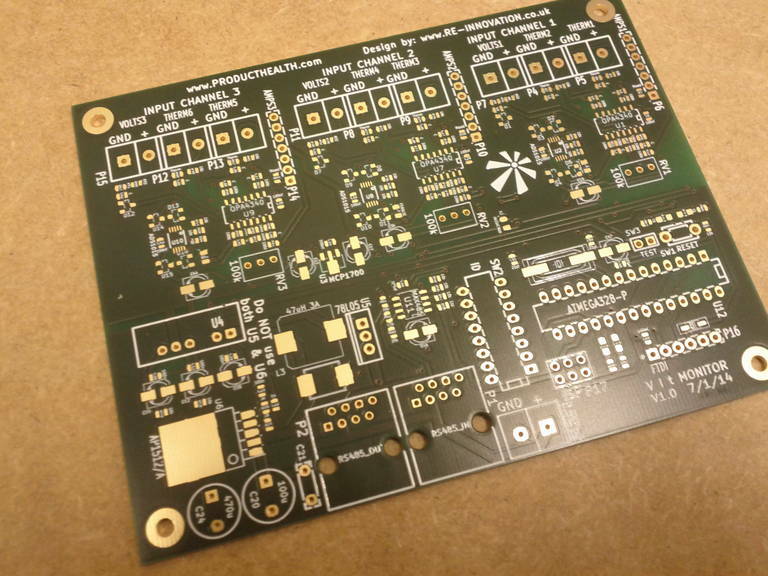 The printed circuit board was designed in KiCAD, which I have blogged about before and think its an amazing open-source project. 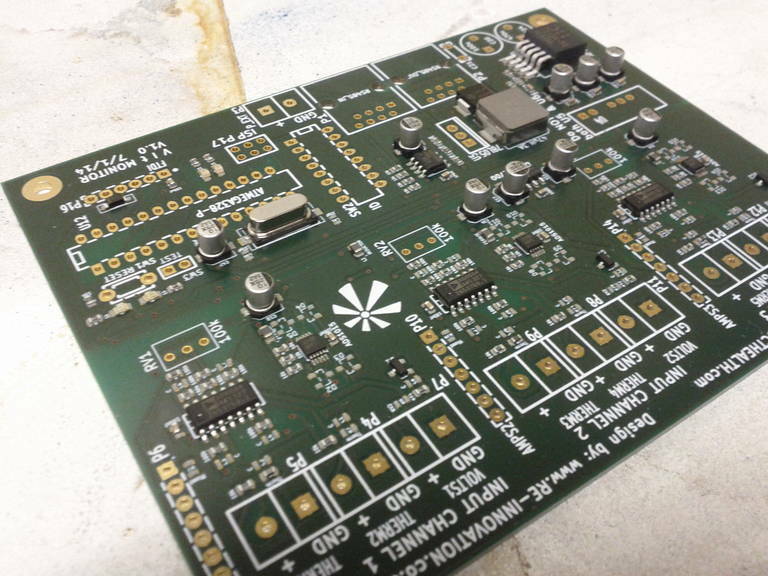 I produced a PCB design with mainly 0603 size SMD passive components. The numbers relate to the width and length of the component in mils (thousands of an inch (I know – get metric…)). I had been given an Adafruit PCB ruler (thanks, Netty) which helped loads with getting to grips with the physical size of things. I had a short deadline for this project (this project is a prototype voltage, current and temperature monitor which I will write about soon). So I needed a quick turn around on the PCB. I used PCBpool for the PCB production. I used their 2-day service and got regular emailed images of the boards production. While quite expensive, the speed and quality could not be matched. The use ENIG gold surface which is a much higher quality result and incredibly level surface for the components. I also needed some decent solder paste and a ‘squeegee’ for the solder paste, both of which I obtained through PCBpools sister company Beta Layout. This arrived very quickly and the paste was a great price, but the delivery cost was quite high (mainly due to needing next day delivery). The PCB was a mixture of SMD and through-hole, but mainly SMD. 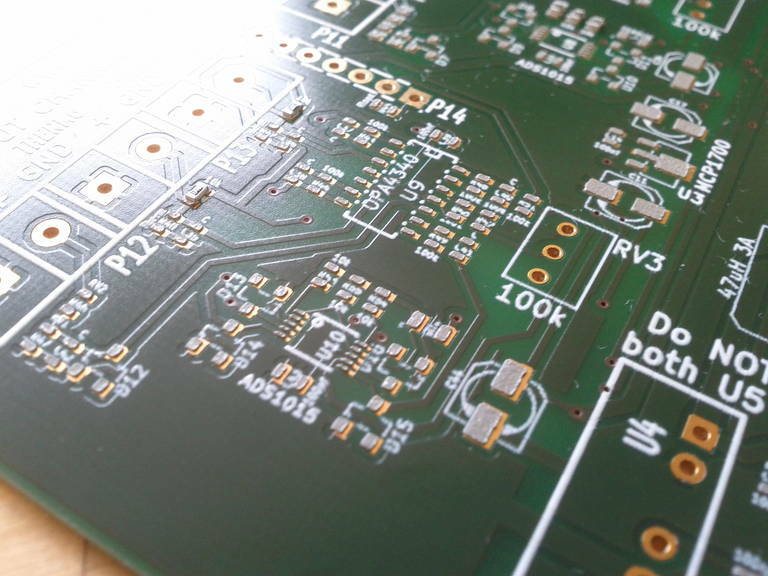 It was one of the best PCBs I have ever had – in terms of quality. Some detail on the circuit board – including the finest pitch component which was a 10 pin TO623-5 package (an ADC). 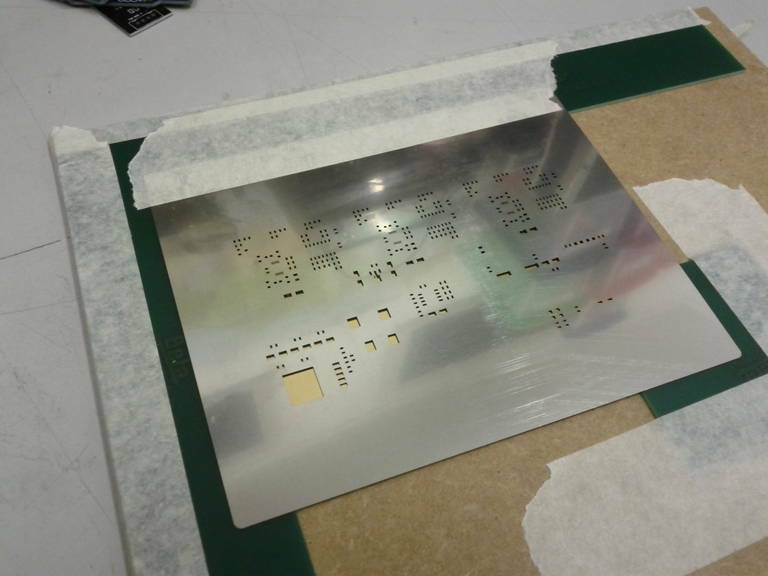 Another great thing about PCBpool is that they also provide a stainless steel solder paste stencil. This makes putting down the solder paste so much easier. 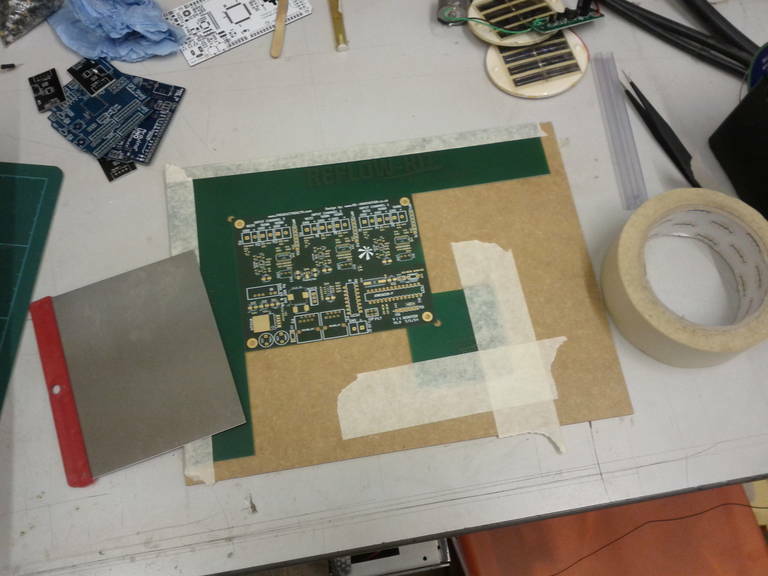 Here is the PCB held within a 1.6mm PCB holder board and using masking tape to hold it in position. The stainless steel solder paste ‘squeegee’ can be seen on the left. The mask was very accurately aligned to the PCB underneath and then taped in place to make a ‘hinge’. This is quite easy as the solder pads were gold. I then put a big load of solder paste alone the top of the mask. Slowly and firmly, I used the squeegee to bring the paste down and fill each of the holes. Never use the squeegee twice as this will cause too much paste to be applied to the other pads. The only way to correct this is to wipe off the paste and try again. I seemed to be in luck as the first time I tried it it filled every pad with a small layer of solder. A close-up shows the solder paste laid down on all the pads – including the tiny amount on the IC. You can see my mask was slightly off, hence the solder paste is on one side of the pads. This is <0.5mm and did not cause any issues. Slowly and carefully I added all the components to the board. I used a decent pair of anti-static tweezers to do this. Ensure the everything is put down with the correct orientation. Also do not push the component around, as this will smudge the solder paste and it will not make a good solder connection. Also all the resistors look the same, so do them in batches and make sure you put them all down (I missed one resistor, which I needed to hand solder afterwards, which was a bit of a hassle). This is the board with half of the components placed. They do not have to be perfectly aligned as the surface tension of the molten solder will ‘pull’ then components into place. 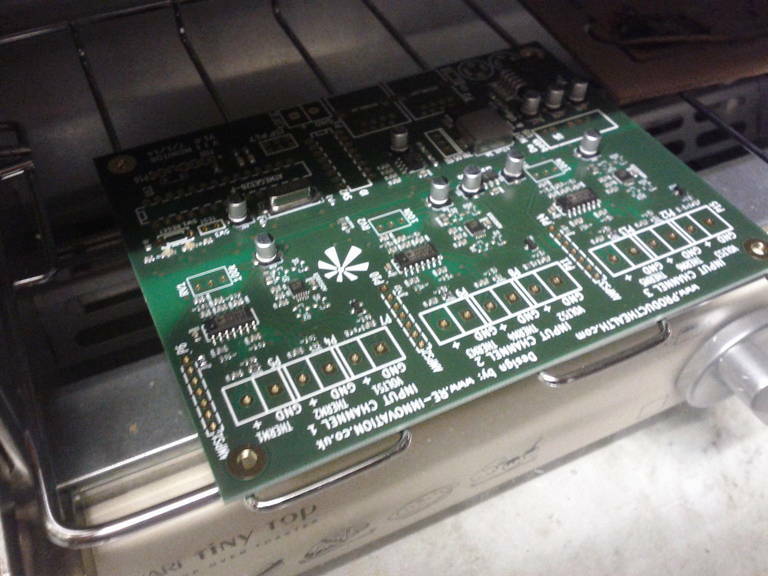 The populated board going into the reflow oven. I had done one cycle with the oven to ensure that it had warmed up slightly. My cycle takes around 5 mins and was done with a mixture of solder paste data sheet and trail and error. The finished and fully completed board. Every single surface mount junction was perfect. 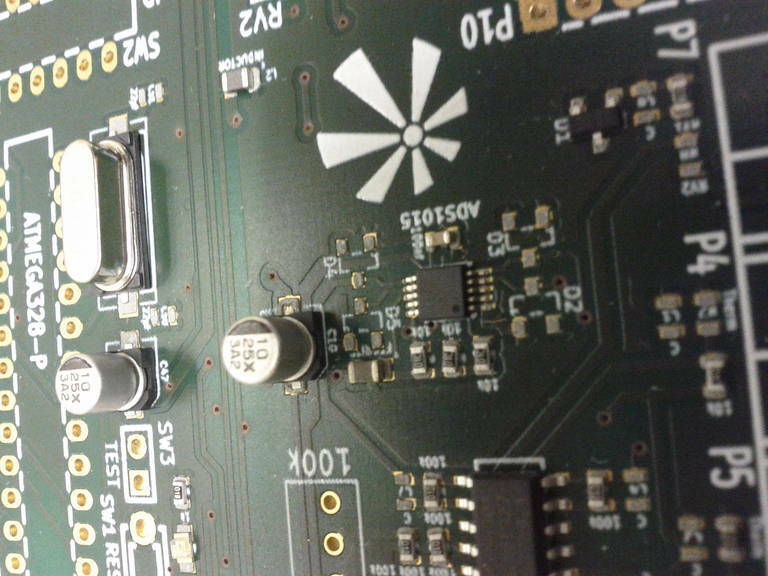 A close up of some of the ICs – even though only a tiny amount of solder paste was applied all the connections soldered correctly. 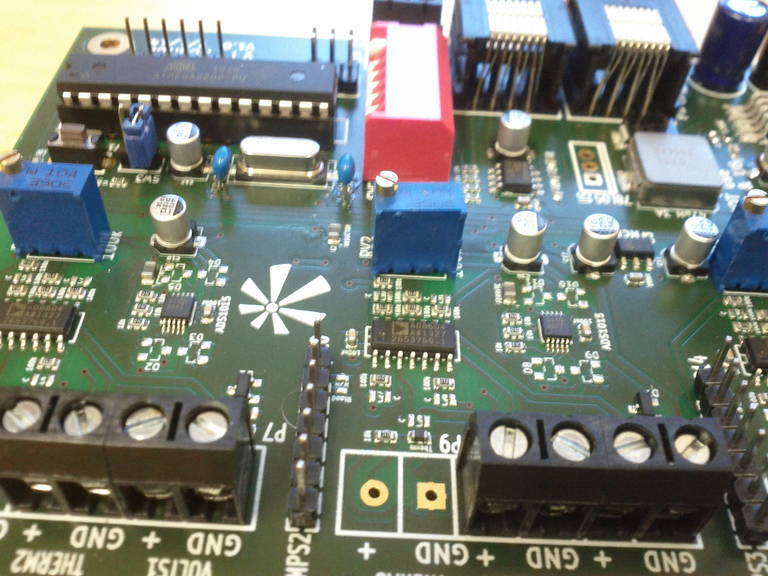 Amazingly I only made two mistakes on the PCB design, which were quite easy to correct. So I am quite a convert to the surface mount technique, but not for everything. 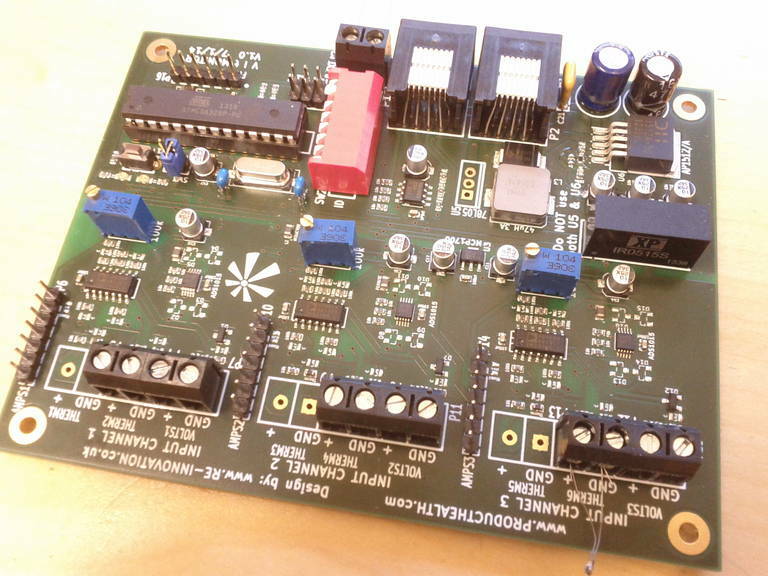 Its great for batches of PCBs which need to be made quickly and accurately. It’s not so good for prototyping and any changes are fiddly to do due to the small pads. 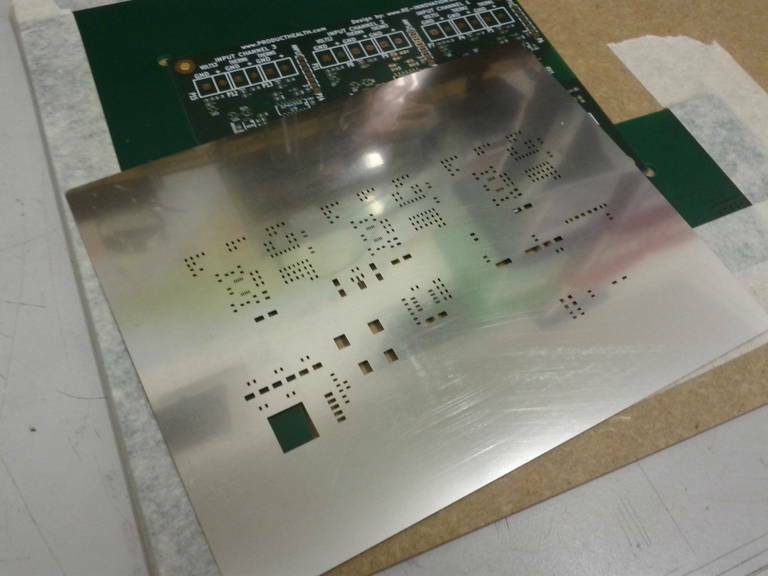 Also it’s not great for kits, as people usually do not have access to PCB reflow ovens and stencils. I will definitely use this technique for small runs of prototypes and products, but probably stick with through-hole for the kits and for my first version prototypes.